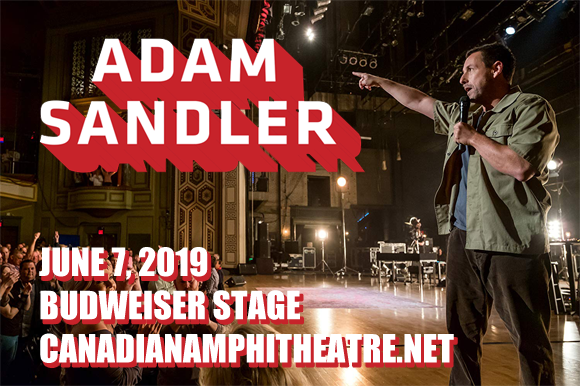 Adam Sandler comes to Budweiser Stage on Friday 7th June 2019 on the 100% Fresher Tour! Taking inspiration from his hit 2018 Netflix special 100% Fresh, Sandler's tour marks a triumphant return to the stage for this stellar comic, and sees the star wowing fans with brand new skits, songs and a very special guest! Still at the top of his game, Sandler is as funny as ever – comedy doesn't get much better than this! Making his name as a writer and performer on Saturday Night Live in the early 1990s, having been discovered performing stand-up by comedian Dennis Miller, Adam Sandler is an American actor, comedian, screenwriter, film producer, and musician, whose films have grossed over $2 billion (combined) at the box office. Sandler is best known for a string of incredibly popular comedy films throughout the late 1990s and 2000s, including Happy Gilmore (1996), The Wedding Singer (1998), The Waterboy (1998), Big Daddy (1999), Little Nicky (2000), Anger Management (2003) and 50 First Dates (2004). He has also received critical acclaim for his dramatic roles in Punch-Drunk Love (2002), Spanglish (2004), Reign Over Me (2007), Funny People (2009), and The Meyerowitz Stories (2017). Sandler has also released five comedy stand-up specials throughout his career, two of which have been certified double-platinum, and two have been certified gold. Sandler returns in 2019 with his first comedy special in fifteen years – 100% Fresh.